Bo Burks of Burks Excavation reviews the company's new CASE 621G wheel loader. Burks recently invested in several new pieces of equipment with the help of Burks Tractor—a CASE 621G wheel loader, 850M dozer, CX130D and CX210D excavators, TR310 and TV370 CTLs and a CX60C mini excavator. CASE G Series wheel loaders are the Tier 4 Final, feature-packed successor to the company’s F Series. In addition to increased power and fuel efficiency, the G series provides an all-new operator environment, controls and digital interface. The cab of the 621G is engineered for improved comfort and ergonomics. This includes three seat options, including a premium heated air-ride seat, as well as seat positioning, control adjustability and leg room that provides ideal comfort for operators of all sizes. A one-piece rounded windshield, rear grid defroster and optimally placed redesigned external mirrors all improve visibility on all sides of the machine. Burks has two CASE D Series excavators, a CX130D and CX210D, and has noted the responsiveness, smoothness and consistency of the CASE Intelligent Hydraulic System (CIHS). The CASE Intelligent Hydraulic System and its four integrated control systems make the best use of the machine’s hydraulic power and momentum, resulting in added strength and fuel efficiency. Using improvements to the Spool Stroke Control system, D Series excavators re-use hydraulic fluid whenever possible to automatically increase cycle times and efficiency. The operator experiences a more productive machine without losing the precision of the machine’s controls. The CASE TV370 is a 74-horsepower machine that combines a maintenance-free Tier 4 Final solution with the strength and reach of a large-frame CTL. The TV370 provides a 3,700-pound rated operating capacity and a vertical-lift design that makes it ideal for loading trucks and lifting and placing heavier palletized materials—it’s the perfect machine for Burks’ custom residential work. Using a large-frame CTL to do the finish-grading on smaller projects, as opposed to a smaller dozer, is a trend that Burks has embraced. Achieving final grade on a residential project is a job that is easily handled by the TV370. “The TV370 has sped up our finish product ability, probably by two times, at least. If you know how to manipulate the machine, we build berms, we grade berms, we grade yards. 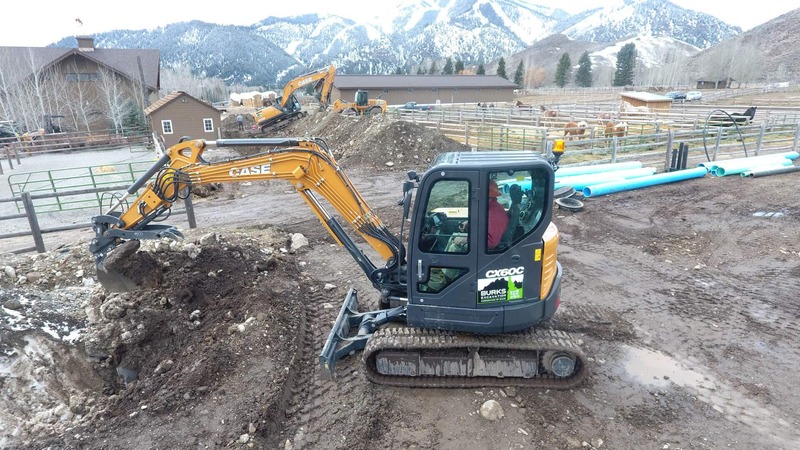 Excavating companies often need a smaller excavator to help solve some of the accessibility problems that come along with tight residential work. With best-in-class horsepower, the CX60C is the largest and most powerful mini excavator CASE has ever produced. Weighing 12,940 pounds, it features a short radius tail swing design for operating in close quarters. The CX60C provides a spacious, stress-free operator environment and features excellent all-around visibility, ergonomic controls, adjustable seating and line-of-sight digital displays for improved operator comfort. The standard deluxe cab of the CX60C represents the most advanced, comfortable and productive cab ever found on a CASE mini excavator. Burks decided to opt for an optional rear-view camera. In tight quarters, precision is critical, that’s why the CX60C comes standard with an adjustable swing boom that is able to travel 70° left and 50° right in order to achieve optimal digging conditions and minimize movement of the machine on site. Burks also recently purchased a CASE SV208 for sub-grade compaction applications for roads, sidewalks and residential projects. The SV208 features best-in-class centrifugal force, which allows for higher lifts and deeper compaction depths completed in fewer passes for increased productivity. With a self-adjusting torque control system and the most climbing power in the industry, the SV208D is built to perform in the tough terrain of Southern Idaho. Available in both open and cab configurations, the SV208D features a spacious, comfortable and intuitive operator environment with an adjustable seat that swivels up to 50 degrees, providing excellent visibility of the drum surface. Rear visibility is maximized with a sloped rear deck design. As development in Sun Valley continues unabated in road construction, commercial and residential building, there is no shortage of quality contractors in the area to complete the work, but Burks is confident that they will continue to play an important role in the future growth of the area.